A thunderstorm overnight has brought temperatures down to the 20s and has provided the garden with a good drink and the gardener with the opportunity to do some tidying up… after all, I wanted to make my view look a bit respectable before showing it to you today! When I took the photos it was drizzling slightly, but already it is raining quite hard again. 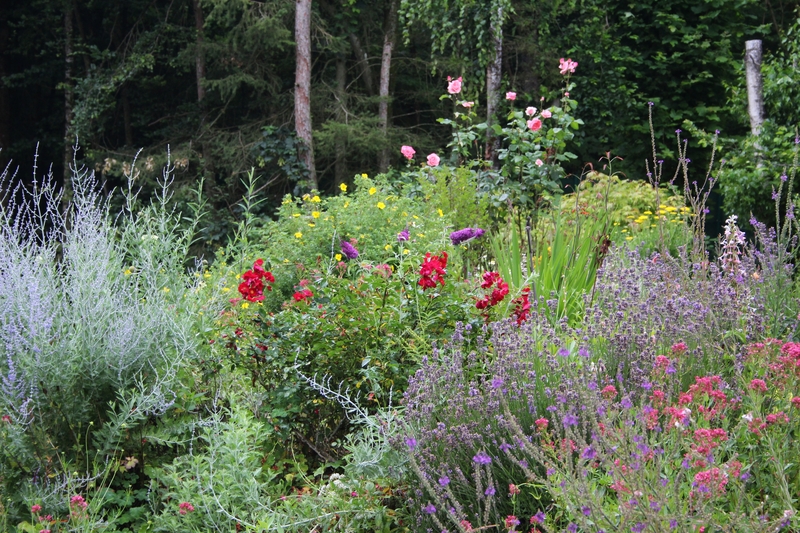 Both the Lavender and the purple Linaria are going over – we had some pretty high temperatures at the weekend. But now the Perovskia is slowly becoming the focus, while the red rose (cut back this morning) is still going strong with plenty of new buds. The Centranthus has run out of steam and although I have only trimmed it back, I don’t think it will flower much more this summer… with no hummingbird hawk-moths to visit it has little function anyway, as the bees and most butterflies (except the skippers) seem to prefer the lavender and other flowers. And now my dwarf Buddleia (‘Buzz Velvet’) is also out (just behind the red rose at the top of the rockery) so the Marbled Whites and Tortoiseshells have been visiting its rich magenta blooms. By next week my Crocosmia should also be visible (you can see the leaves behind/to the right of the buddleia) … exciting for me as they rarely flower in our normal summers. They clearly like a damp spring. This entry was posted in Garden, Tuesday View and tagged Garden, Nature, The Tuesday View. Bookmark the permalink. My crocosmia was one of the first plants I put in, and I think I have had one bloom so far! So I will be celebrating this year as there are 5 or 6 about to open! 🙂 Glad you could join in again Susie. It was actually quite pleasant working in the showers today, as it was lovely and cool! Yes, we have had more than our fair share of rain this year. Hope you get a cool shower soon! Not really likely for at least another month. Oh, many subtle changes from last week. It is amazing to watch the progress. I love the red rose draws the eye up and beyond. I will join you later as I have to wait for the sun to lower! The rose has had so many flowers on it – it’s been a good year for the roses here. 🙂 Look forward to seeing your view too. Here in California it never rains in the summer. Our garden would so different with more water! I adore all the lush shades of green, a cradle for each and every bloom. The rain sounds nice, the cooling off even better. I was eyeing a few newer buddleia this week at the nursery and they had some great colors! Here’s my view from the droughty NE US. I wanted a dwarf buddleia so I can still look across the top of the rockery when sitting on the patio, so that narrowed down the choice, but I really like this colour! The paler one down at the bottom of the west rockery is not in flower yet. I also have a golden one with buds on. Can’t wait to see that flower as it didn’t do much in its first year. I just hooe they all attract loads of butterlies! 🙂 Hope you get some good rain soon Frank. If I could send you some of ours I would! Thanks for a lovely comment Kourosh! The pleasure is mine. Everything looks very lush and abundant. You must be getting a decent amount of rain – can’t see any summer crunchies. 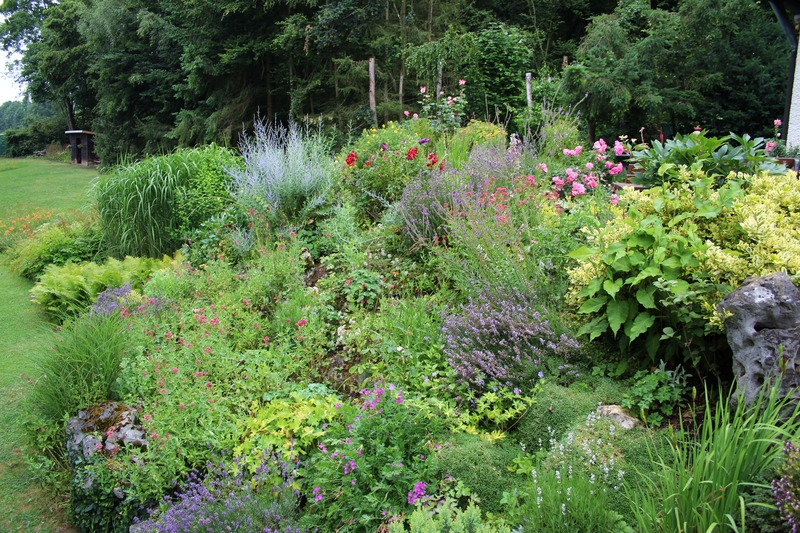 It has been very damp all spring and early summer, so the garden is looking much greener than usual. I wonder what August will throw at us this year. Last summer was the opposite – a dry spring and hot and dry summer. At least I have hardly had to water anything, even my pots have got enough rainwater! Thanks Kimberley. It’s a wonderful time of year, I agree! Oh, and I’m very eager to see your Crocosmia. I’ve been tempted, but haven’t tried any yet in my own gardens. What a lovely rockery! Beautiful colour and lots of interesting plants! It’s lovely to see your Perovskia colouring up. Last year I overwatered mine, so of course this year I haven’t given it quite enough, otherwise it would be blooming more strongly now, I think! The way yours shows up against the grasses is quite nice! I think the Perovskia can cope well with drought and heat but then of course I don’t really know about desert gardening! It has been unusually wet this year but the rockery is very stony and well-drained, so I can only really grow plants that like relatively dry conditions and can withstand strong summer sunshine. And cold winds and frosts in winter! Glad you could join in again Amy! I love feasting my eyes on your garden. It’s a treat. I’m glad the rain cooled things off for you. Not a drop here, unfortunately for a few more months. Cathy, it’s so often to story of our world: getting resources where they are needed. Too much rain in some places, not enough in others. Excess crops, not enough crops. And so it goes. One day we’ll sort it out. I’m sure of it. My pumpkins…you can’t imagine. I’ve already harvested two and have three more ready to go in about a week. My new crop (the one I planted) is just getting underway, so it seems for the first time ever I’ll have two crops in a season. Crazy fun. I hope you get some dry days soon. [J] Not sure which is more difficult to manage, sheep or plants in an herbacious border. Getting in amongst either after rain results in being soaked from the knees down – or worse, and both tend to include some members that have an inclination to strike out for new territory. LOL! Yes, after tidying up the rockery I was soaked to just above the knees. It’s a bit treacherous in there when the ground is wet, but I know the footholds by now!